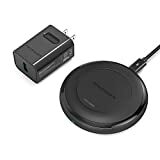 There are a thousand and one wireless charging pads on Amazon right now, and they range in price from $10 to $100 and beyond. For $10, you can get a perfectly fine wireless charger that’ll work well with your iPhone 8, iPhone 8 Plus, or iPhone X. Of course, some people want premium accessories to go with their premium smartphones. Check out the RAVPower Fast Wireless Charger on Amazon. It’s our favorite model and it sold out pretty quickly last time we covered it. It’s back in stock right now though, so grab one while you can. The fast wireless charging for newest iPhone will become available in a later iOS 11 update. Current iOS cannot support 7.5W fast charge. As of right now, standard charging is all it supports. Supports future iPhone 8 / 8 Plus / X up to 7.5W Charging: 50% faster than traditional 3.5W – 5W wireless chargers with a maximum 7.5W output.